Helen Frakenthaler known for creating the technique of staining raw canvas, a pioneer in the color field painting movment, former wife to Robert Motherwell and a key player in the abstract exrpessionist movement is bar none the artist I admire the most. 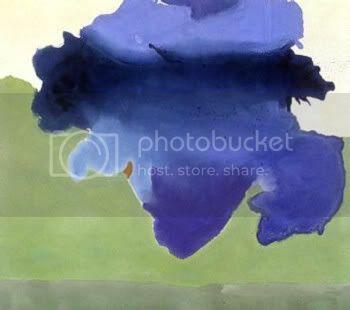 Helen Frankenthaler was born in New York City on December 28, 1928, daughter to justice of the New York Supreme Court. She attended the exclusive Brearley School in Manhattan and the Dalton School where her art teacher was Rufino Tamayo. More than any other known established artist, Ms. Frakenthaler's art rocks my world. I love so many of her pieces. I love her style. I love her work beacause its bold and confident and bursting with color. I love that very seldom you see brush marks...this intrigues me and something I aim to emulate in much of my work. In an interview pubished in the new york times, she says about her painting process : ''With any picture, on paper or on canvas, the main idea is: does it work? Is it beautiful?'' Which resonates with me and answers questions about my own work and process. Honestly, I hadn't come out and said it so clealry and sycinctly, but this is what is going on for me also when I paint: is the piece working? is it beautiful? I also think its very cool that in a time when most of her contemporaries were men - Clement Greenberg Hans Hofmann, Jackson Pollock - She, a Woman, was making strides, making great art. TOday, yup last time I checked Helen's very well alive and painting in NY, she paints very similarly to me in that she paints in acrylics, painting laying flat and on waist high table tops. Cool. Here here are some links to some of her work that I adore... Enjoy! Helen Frankenthaler, Seeing the Moon on a hot summer day, 1987, private collection. Helen Frankenthaler, After Mountains and Sea , New York : Guggenheim Museum 1956-1959.